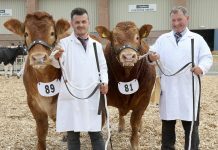 The British Limousin Cattle Society organises approximately 17 sales at six sale centres in the United Kingdom each year. Animals entered are catalogued with pedigree details, recorded performance data and the Society’s helpful animal index line. Once at the sale centre, all entered bulls and females have to pass through an official inspection. This usually takes place the day before the sale and differs slightly for the two genders. All animals are checked by the Society’s vet for eye cataracts, over or under-shot jaws and general health. In addition, bulls have their scrotal circumference measured and testicles are checked by hand for any irregularities in form or texture. Similarly, the vet checks the females’ udders for abnormalities. 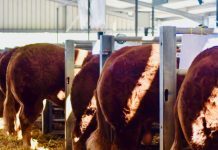 A team of appointed inspectors then assesses bulls and females for locomotion, temperament, conformation and breed characteristics to a Society standard. Ear tags are also checked by an official representative and must be accurate and legible. Any bull or female that fails the inspection is rejected from the sale. The only exception is over or under-shot jaws described by the vet as marginal these animals can be sold, but not shown in the sales shows. These take place prior to each official haltered sale, and provide a good opportunity for visual assessment by potential bidders. The standard of stock brought to the sales is high and the inspections are in place to give buyers added confidence when assessing prospective purchases. 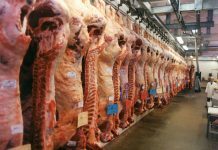 Similarly, the carefully worded auction rules and conditions of sale agreed by the industry through the National Beef Association ensure that buyers purchase guaranteed stock. These rules are independently administered by the Society’s officially appointed auctioneers. As part of the after-sale service, all pedigree certificates are transferred free of charge and any non-member purchasers are forwarded with information about the Society and how to join. In addition to the Society’s official sales, many breeders hold production or reduction sales. These take place under Society rules either at an appointed auctioneer’s market or on-farm. However, these animals are not sold subject to the full inspection described above and have a tag check only. 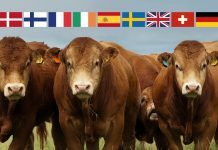 The sales attract both pedigree breeders and commercial producers and are particularly useful for sourcing specific bloodlines. The Society advertises its official sale dates in the national agricultural press, relevant regional papers and in its own publications. 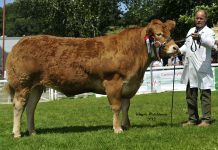 If you are unable to attend a sale or simply have a query about the availability of Limousin stock, the staff at the Limousin centre will be pleased to assist you. Each area of the country has an affiliated Limousin club. The representatives of these clubs provide a local contact for the breed and are happy to provide information or answer any queries.